First a/c designed with digital computers being used for both aerodynamic analysis and designing the structural matrix (and a whole lot more). First a/c design to have major components machined by CNC (computer numeric control); i.e., from electronic data which controlled the machine. First a/c to be developed using an early form of "computational fluid dynamics" with an integrated "lifting body" type of theory rather than the typical (and obsolete) "blade element" theory. First a/c to have marginal stability designed into the pitch axis for better maneuverability, speed and altitude performance. First a/c to have negative stability designed into the yaw axis to save weight and cut drag, also boosting performance. First a/c to fly on an electronic signal from the stick and pedals. i.e., first fly-by-wire a/c. First a/c to fly with fly by wire AND artificial feedback (feel). Not even the first F-16's had this. First a/c designed to be data-link flyable from the ground. First a/c designed with integrated navigation, weapons release, automatic search and track radar, datalink inputs, home-on-jamming, infrared detection, electronic countermeasures and counter-countermeasures operating through a DIGITAL brain. First high wing jet fighter that made the entire upper surface a lifting body. The F-15, F-22, Su-27 etc., MiG-29, MiG 25 and others certainly used that idea. First sophisticated bleed-bypass system for both intake AND engine/exhaust. Everybody uses that now. First by-pass engine design. (all current fighters have by-pass engines). First combination of the last two points with an "ejector" nozzle that used the bypass air to create thrust at the exhaust nozzle while also improving intake flow. The F-106 didn't even have a nozzle, just a pipe. Use of Titanium for significant portions of the aircraft structure and engine. Use of composites (not the first, but they made thoughtful use of them and were researching and engineering new ones). Use of a drooped leading edge and aerodynamic "twist" on the wing. Use of engines at the rear to allow both a lighter structure and significant payload at the centre of gravity. Everybody copied that. First missile armed a/c to have a combat weight thrust to weight ratio approaching 1 to 1. Few have been able to copy that. First flying 4,000 psi hydraulic system to allow lighter and smaller components. First engine to have only two main bearing assemblies on a two-shaft design. First to use a variable stator on a two-shaft engine. First use of a trans-sonic first compressor stage on a turbojet engine. First "hot-streak" type of afterburner ignition. The Avro Arrow was one of Canada's finest aviation achievements, even though it never entered service. In the post-Second World War period, the Soviet Union began developing a fleet of long-range bombers capable of delivering nuclear weapons to North America and Europe. To counter this threat, Western countries developed interceptor aircraft that could engage and destroy these bombers before they reached their targets. A. V. Roe Canada Limited had been set up as a subsidiary of the Hawker Siddeley Group in 1945, initially handling repair and maintenance work for aircraft at Malton, Ontario Airport (today known as Pearson International Airport, Toronto's main airport). 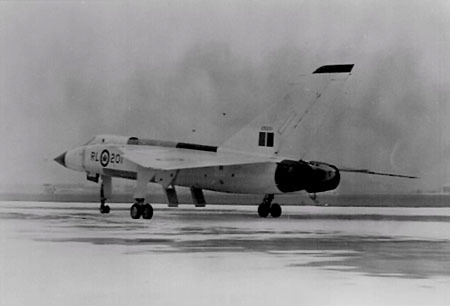 The next year the company began the design of Canada's first jet fighter for the Royal Canadian Air Force, the Avro CF-100 Canuck all-weather interceptor. The Canuck underwent a lengthy prototype period before entering service seven years later in 1953. It would nevertheless go on to become one of the most enduring aircraft of its class, serving into the 1980s in a variety of roles. Avro engineering had been considering supersonic developments for some time at this point. German research during the Second World War had identified a number of solutions to the problems associated with supersonic flight. It was known that the onset of wave drag was greatly reduced by using thinner airfoils with much longer chord, but these airfoils were impractical because they left little internal room in the wing for armament or fuel. Instead, aerodynamicists employed a swept-wing design to "trick" the airflow into behaving as though it was flowing over a long, thin wing. Almost every fighter project in the postwar era immediately applied the concept, which started appearing on production fighters in the late 1940s. Avro engineers had previously explored swept-wing and tail modification to the CF-100 known as the C103, which had proceeded to wooden mock-up stage, and offered transonic performance with supersonic abilities in a dive. However, the basic CF-100 continued to improve through this period, and the advantages were eroded. When Janusz %u017Burakowski broke the sound barrier in a dive, interest in the C103 waned. Another solution, picked up by the Avro engineers, was the delta-wing design. The delta-wing had many of the same advantages of the swept wing in terms of transonic performance, but offered much more internal room and overall area. This providing more room for fuel, an important consideration given the thirsty engines of the era, and the large wing area provided lift at high altitudes. The disadvantages of the design were increased drag at lower speeds and altitudes, and especially higher drag while maneuvering. For the interceptor role these were minor concerns, as the aircraft would be spending most of its time flying in straight lines at high altitudes and speeds, mitigating these disadvantages. "At the time we laid down the design of the CF-105, there was a somewhat emotional controversy going on in the United States on the relative merits of the delta plan form versus the straight wing for supersonic aircraft%u2026 our choice of a tailless delta was based mainly on the compromise of attempting to achieve structural and aeroelastic efficiency, with a very thin wing, and yet, at the same time, achieving the large internal fuel capacity required for the specified range". Further proposals resulted in two versions of the design known as C104: the single engine C104/1, and twin-engined C104/2. The designs were otherwise similar, using a low-mounted delta-wing and powered by the new Orenda TR.9 engines. Armament featured a battery of Velvet Glove missiles, (a Canadair Aircraft product based on CARDE design work), stored in an internal bay. It would be crewed by a single pilot guided by a completely automatic weapons control system to track and attack the target, similar to the system utilized in the F-86D. The primary advantages of the twin-engine C104/2 version was that it was larger overall, with a much larger weapons bay, and that it provided twin-engine reliability. The proposals were submitted to the RCAF in June 1952. Intensive discussions between Avro and the RCAF examined a wide range of alternative sizes and configurations for a supersonic interceptor, culminating in RCAF Specification AIR 7-3 in April 1953. * Crew of two (It was considered unlikely even a fully automated system would reduce workload enough to allow a lone crewman). * Twin engines (no single engine then available could lift the fuel load needed for the long-range missions the RCAF demanded). * Range of 300 nautical miles (556 km) for a normal low-speed mission, and 200 nautical miles (370 km) for a high-speed interception mission. * Operation from a 6,000 foot (1830m) runway. * Mach 1.5 cruise at an altitude of 50,000 feet (15,000 m). * Maneuverability (2 g turns with no loss of speed or altitude at Mach 1.5 and 50,000 feet). * The time from a signal to start the engines to the aircraft's reaching 50,000 feet and Mach 1.5 to be less than five minutes. * Turn-around time on the ground was to be less than ten minutes. An RCAF team led by Ray Footit visited U.S. aircraft producers and surveyed British and French manufacturers before concluding that no existing or planned aircraft could fulfill these requirements. Avro submitted their modified C105 design in May 1953, essentially a two-man version of the C104/2. A change to a "shoulder-mounted" wing allowed rapid access to the plane's internals, weapons bay, and engines. The new design also allowed the wing to be built as a single structure sitting on the upper fuselage, simplifying construction and improving strength. The wing design required a long main landing gear that still had to fit within the thin delta wing, presenting an engineering challenge. Five different wing sizes were outlined in the report, from 1,000 to 1,400 square feet (93 to 130 m²). The 1,200 square-foot (111 m²) version was eventually selected. Three engines were considered as well: the Rolls-Royce RB.106, the Bristol B.0L.4 Olympus, and the Curtiss-Wright J67 (a license-built version of the Olympus). The RB-106 was selected, with the J67 as backup. The weapons bay design was larger than the original C104/2 design, situated in a large thin box on the bottom fuselage, running from a point adjacent to the front of the wing to the middle of the fuselage. The weapon system originally selected was the Hughes MX-1179, which was a pairing of the existing MA-1 fire-control system with the AIM-4 Falcon missile of both radar-guided and heat-seeking variants. This system was already under development for proposed use in the USAF's WS-2011954 interceptor (dating from 1949, which would lead to the F-102 Delta Dagger). The Velvet Glove radar-guided missile had been under development with the RCAF for some time, but was considered unsuitable for supersonic launch, and further work on that project was eventually cancelled in 1956. In July 1953, the proposal was accepted and Avro was given the go-ahead to start a full design study. In December, $27 million was provided to start flight modeling. At first, the project was limited in scope, but the introduction of the Soviet Myasishchev M-4 Bison jet bomber and the Soviet Union's testing of a hydrogen bomb dramatically changed Cold War priorities. In March 1955, the contract was upgraded to $260 million for five Arrow Mark 1 flight-test aircraft, to be followed by 35 Arrow Mark 2s with production engines and fire-control systems.